Reality Check On Campaign-Finance Reform: It Would Be Difficult And Slow : It's All Politics Even most candidates who are championing overhauling the system are taking superPAC money and grappling with the political reality they have to face if they want to win. Demonstrators march in the snow outside the White House during a rally against the Supreme Court's decision five years ago in favor of Citizens United, which allows private citizens and corporations to make unlimited donations for political campaigns. Candidates are championing campaign-finance reform this year at a heightened pitch even as they're still forced to cope with the realities of the uneven playing field if they want to survive politically. Democrat Hillary Clinton was the latest to weigh in with her plan on Tuesday, outlining how she would curb the growing influence of money in politics. Her chief rival, Vermont Independent Sen. Bernie Sanders, has long made the issue a cornerstone of the insurgent movement he's inspired. And the latest candidate to jump into the Democratic fray, Harvard Law professor Lawrence Lessig, is running solely on the issue. While the furor against these campaign-finance vehicles comes mostly from the Democratic side, and is a big issue with Democratic voters, some Republicans have begun to acknowledge the problem and offer solutions, too. The greatest indicator yet that it is becoming an issue among GOP voters is the rise of Donald Trump. The billionaire businessman is self-funding his campaign and won't accept any corporate money or donations and says he's beholden to no one — a large part of his appeal to primary voters. But each of their plans and calls for reform can't be enacted swiftly — or probably at all — in this political climate. Meanwhile, most of them have superPACs and have raised money for them to boost their own bids. That has forced them to play by the realities of the current rules even as some decry the rules as they are. 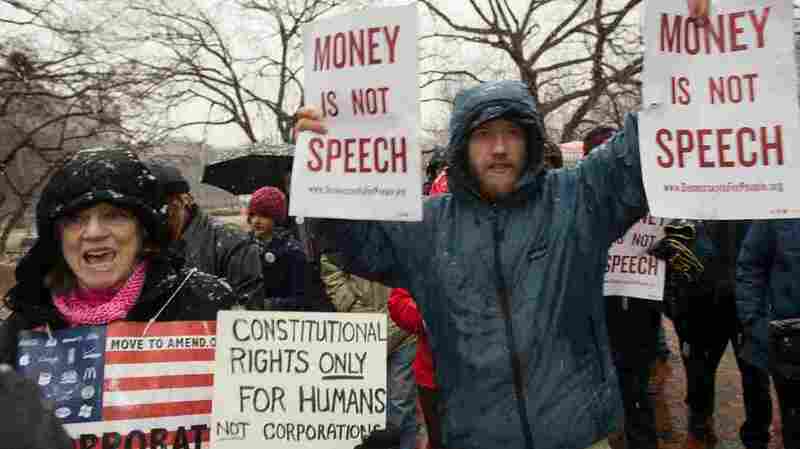 overturn the Citizens United decision that opened the money floodgates and made way for superPACs five years ago. backing a constitutional amendment to limit the outsize influence of wealthy donors and special interests. requiring all federal government contractors to disclose all political spending. a public small-donor matching system for presidential and congressional candidates. Yes and no. If she were president, Clinton may be able to nominate justices who would overturn Citizens United, but they could face a difficult confirmation. And even if they did get through, there's no guarantee they could change the court's makeup enough to change the outcome. As for her proposal for a constitutional amendment on the issue, that's a long and tedious process and one that would likely be dead on arrival in a GOP-controlled Congress or a divided one. It's been over a decade since the McCain-Feingold Bipartisan Campaign Reform Act, otherwise known on Capitol Hill as BCRA, went through Congress. And the institution is far more polarized now. Some of her other plans, like increasing disclosures for companies and government contractors, could feasibly be done, but would still likely meet Republican resistance. Clinton, though, indicated that some of her proposals she might try through executive order. What have other Democratic candidates said? Sanders, Clinton's chief rival, has long championed campaign finance reform, and his insurgent campaign has been fueled, in large part, by a disgust with the growing influence of money in politics. co-sponsored legislation to increase transparency. supports public funding of elections. "The Koch brothers, the second wealthiest family in America, plan to spend some $900 million in the coming 2016 election — more money than either of our major parties spent in the last election," Sanders says on his website. "That is not democracy. That is oligarchy." The appetite for the issue even spurred Lessig, a relative political unknown, to officially get in the race for president this weekend after raising $1 million via a Kickstarter campaign. Citizens Equality Act of 2017 — to reform campaign finance and voting rights. He says he'll serve only as long as it takes to enact the law, and then would step down and let his vice president take over. Do they still have superPACs? Clinton does in Priorities USA Action, along with other smaller groups. She's raised money for the group and has embraced it — albeit reluctantly. That's much like President Obama did in 2012, recognizing that superPACs were, as they saw it, a necessary evil in order to combat Republicans, who successfully used superPACs and other groups to win in a landslide in the 2010 midterms shortly after Citizens United was decided. Sanders says he won't accept any superPAC help but has only obliquely criticized Clinton for accepting support from one. "We will be outspent," Sanders told CNN Friday. "Let me just say this. I know we will be outspent by our opponents. We don't have a superPAC. We're dependent upon small, individual contributors, but I think that grassroots movement that you saw out there, that's what's going to win it for us." But it's not contradictory to both want to do away with superPACs but also utilize their help, contends Viveca Novak of the Center for Responsive Politics. "I think they recognize that you can't hope to change things unless you're in office," she said. "How do you get there? You have to play the same rules as the Republicans are playing. Whether they like it or not, those are the rules of the game right now. If you don't use them, it's not going to turn out well." Are any Republican candidates for campaign-finance reform? Republicans have largely been the beneficiary of these types of secret-money groups, and they have certainly used them to their advantage. Trump: But even among the GOP electorate, there does seem to be a growing anger about money in politics — personified in the rise of Trump. While the current GOP front-runner hasn't laid out a specific plan to reform the system, he has called the current system a "disgrace" and hit his other rivals for accepting the money, saying he "loves" the idea of campaign finance reform. Graham: South Carolina Sen. Lindsey Graham, a close ally of BCRA co-author Arizona Sen. John McCain, has also said he supported the repeal of Citizens United. Christie: New Jersey Gov. Chris Christie supports an unlimited contribution system with immediate disclosure. "There has to be an absolute rule that 24 hours later you will reveal those contributions on the Internet, publicly available, so members of the public can scroll down on their computer," he said at a New Hampshire town hall. Fiorina: Former Hewlett-Packard CEO Carly Fiorina has said the system is obviously broken, but that the current reforms would favor Democrats. "I'm OK with any set of rules as long as it's the same for everybody, it's completely transparent and we understand who's giving the money to what," she said last month in Iowa. The current web of campaign finance is here to stay in 2016, and this cycle will be the most expensive ever. And if a pro-reform candidate does win, they'll still face plenty of hurdles at undoing the current system — a Pandora's box which Citizens United opened.